Everyone thinks that if one writes about wines, they are always enjoying esoteric wines and great vintages, but that is not always the case. There are times when one is having drinking wines with others that do not have the same passion about grapes, but they still like to drink wine. We went and had Christmas Eve out, and my Bride and I were really the only ones that really got into wine, so we were drinking what would be enjoyable for the others. That night we were having dinner of turkey and ham produced by one of the famous national purveyors of these meats, they are known for their special cutting of the meats. I am not a fan of their product, but I was going to have some, just to be social. When our hosts found out that beside me there were others of this same taste, they also decided to prepare a couple of barbequed pork tenderloins, which I opted for. Yes, I am a bit of a food snob, but after having these dishes in the past, I feel that I am free to pass on a dish, and try to find something else to eat. For this dinner we took some bottles of wine that are more in the range of being popular, but still enjoyable. We had the ever popular La Crema Chardonnay 2012 from the Sonoma Coast in California. A Chardonnay wine with some buttery, oakey taste that is very acceptable to the diners that evening. The other wine is also a bit of “go-to” wine for us, when we don’t need anything too fancy for dinner at home. 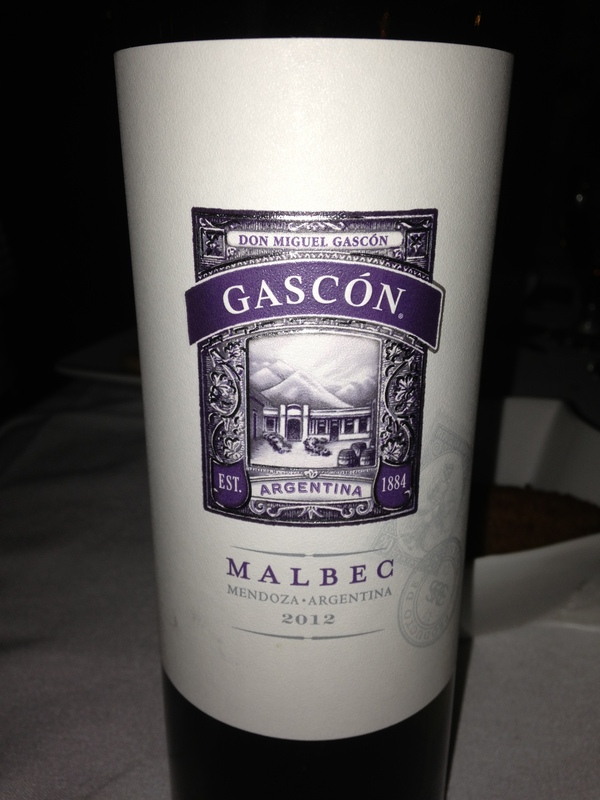 We had a bottle of Gascon Malbec 2012 from Mendoza, Argentina. Malbec is one of the most popular and well grown wines from Argentina, and it does flourish there very well. The next morning there was a large group of us from the night before getting together for a Christmas morning breakfast of omelets, bacon and kielbasa, which is a tradition for this group. My Bride was making the Mimosas and I thought it was a rather curious choice of a wine that she selected for the drink, but it worked well, and when you think of mixing a sparkling wine with orange juice, you really do not need Dom Perignon for this drink. 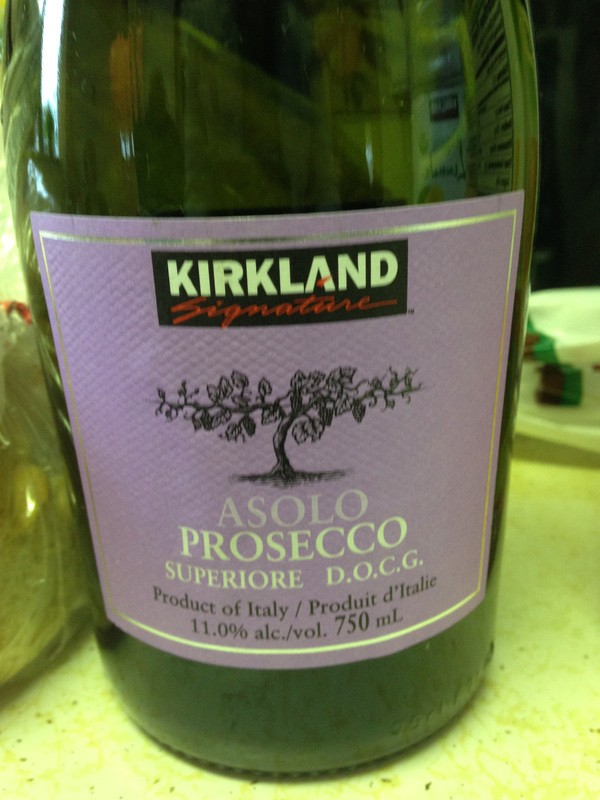 She was making this drink with Kirkland Signature Asolo Prosecco Superiore DOCG NV. The Kirkland brand is from the Costco Company, and I believe that I have read that they are now the largest wine retailer in the United States and they have been selling an assortment of different wines with their own branding. Asolo Prosecco is one of the newest DOCG designations from the Veneto district of north-eastern Italy, as well as a Prosecco DOC designation. These new designations now allow only wines from this area to use the Prosecco varietal, and sparkling wines outside of this district must continue using the older, less known varietal of Glera. The wine was excellent in the Mimosas and very economical as well. This entry was posted in Dining, Wine and tagged Argentina, Asolo Prosecco, California, Chardonnay, Gascon, Glera, Italy, Kirkland Signature, La Crema, Malbec, Mendoza, Prosecco, Sonoma Coast, Veneto. Bookmark the permalink. I like that Gascon Malbec – it is a good value red. I haven’t had it in awhile; I might have to go hunt some down next time I’m at the store. Merry Christmas! Yeah, never use the good stuff for Mimosas!